Another factor in helping your students master this skill is how you have taught the preceding skills up to this point in their training – they should already have a basic understanding and feeling of neutral buoyancy at this point. 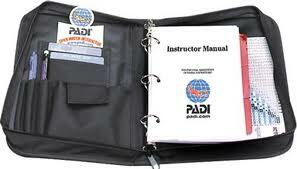 In Confined Water Dive #1 we teach the ‘breathing underwater‘ skill. 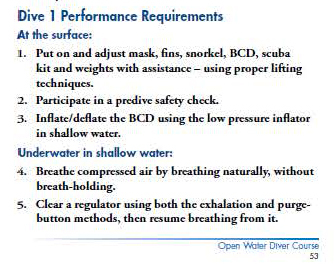 This should be the first skill to teach, and if you haven’t lazily over-weighted your students, they should already have a good understanding of how breathing effects buoyancy. When we reach Confined Water Dive #2, we have our students master the neutral buoyancy skill – usually by the ‘fin pivot’ method. Now the students really get to grips with how changing lung volume changes depth too as they ‘rise and fall in a controlled manner, during inhalation and exhalation’. The next thing I do, to make it easier for them, is to give the student a visual reference. I stand next to them with my hand in front of them, and brief that the idea is to use their lungs to keep their eyes level with my hand. If their eyes go above my hand, they should exhale a little, and if their eyes go below my hand, they need to inhale a little. Once they have the level right, the shorter breaths will help them hold that position.